This low-growing groundcover is a perfect selection for full-sun or part-shade areas. 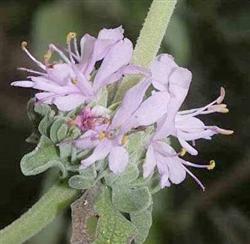 The 'Point Sal' variety is a grayish-green leaved, multi-blossomed Salvia hybrid that exibits low water needs and has little demand in terms of maintenace. The flowers can be pruned in late fall to produce a good flush in the spring. The lavendar flowers are arranged in a circular pattern around the green stems. The flowers attract butterflies, bees, and hummingbirds.